International broadcast consultant Valerie Geller is president of Geller Media International. An in demand speaker, Geller presents Creating Powerful Radio and TV/ Digital Media seminars/ workshops. She also coaches individual talent – on-air personalities and producers and works with newsrooms throughout the world. Contact her here. 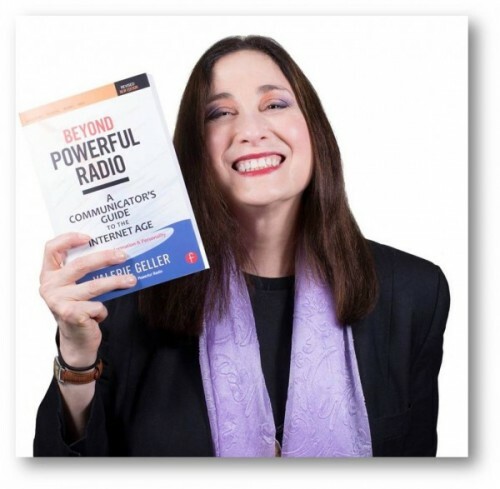 She’s been a familiar face on radio conference platforms around the World for decades, commanding attentive audiences as she shares the secrets of ‘powerful radio’. In this hour of #radiomoments ‘Conversations’, Valerie Geller, who counsels authentic self-revelation from broadcasters, opens up about her own life. She tells of her early experiences as a welcome young caller on a phone-in on her local Los Angeles station, earning her own on-air shifts before moving around the US, speeding through the ranks as a journalist, news director – and then programme director at New York’s famous WABC. Now, as an accomplished international broadcast consultant, her lessons and principles are adopted by numerous leading talk presenters here in the UK and across the planet; and her books are required reading (available here – or a free Audible trial here). In her own words – this is the Valerie Geller story.